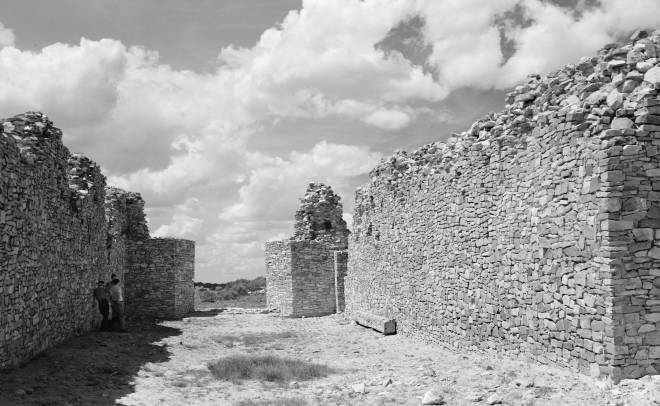 Above: While working for New Mexico Magazine in the 1940s, Thompson made this image of Gran Quivira, now part of Salinas Pueblo Missions National Monument, near Mountainair. Never shall I forget the beauty of sunrise on top of Gran Quivira Monument. Against the pink of the eastern sky was gradually etched the majestic beauty of the old ruins—rugged rock walls and tall towers were silhouetted against the pearly sky, and one could well imagine that they were back in medieval times viewing some old-world temple or castle. And then below me the blue shadows in the valleys were suddenly kissed to rosy light, and the distant mountains turned from somber hues to purest purple. It was all too beautiful for words! No one has seen all the beauties of New Mexico until they have visited Gran Quivira.